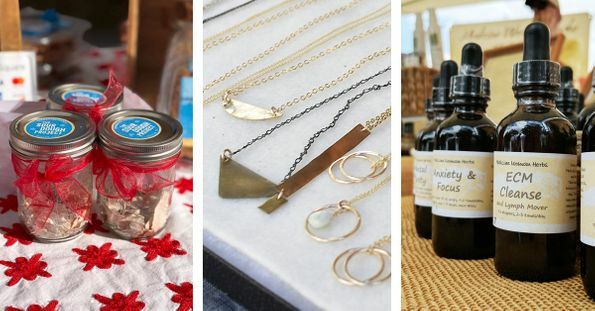 Show your friends and family some local love this holiday season with gifts from the SFC Farmers' Markets! Get your fill of something sparkly from Zahavah Jewelry with pieces inspired by nature, ancient relics and the natural imperfections found in metals and stones. Pieces start around $15, making these perfect pieces for a last minute present. Cocoa Puro has been making chocolate in town since early 2003, find out why they have such staying power when you pick up a bag of crunchy Kakawa Beans, caramely cocoa beans covered in 5 layers of chocolate. Heading to a party and looking for a low maintenance party tray? Try one of the fresh roasted salsas from Beba’s Phresh Salsa. The Hot Habanero is our favorite stand in for a Mexican style sriracha, and the mild tomato salsa is sure to please kids and grownups alike. Keep the dip train rolling over to Floreli Foods and grab a container of sunflower seed hummus in flavors like garlic dill and spicy curry. Need something to mop up all this goodness? Look no further than The Sourdough Project who has you covered for all things cracker! These tasty bites are made with flour from local miller Barton Springs Mill and flavored with sea salt, everything or za’atar. For something a little more substantial remember you can buy frozen packs of tamales from Tamale Addiction. The pork tomatillo is a real crowd pleaser, for something on the spicy side bring home the poblano muenster. These aren’t the only frozen cheesy bites you can heat up yourself - make sure to check out the take-home bags of pão de queijo from Lua Brazil. Flavors range from basil to hatch, snickerdoodle to chocolate, original cheese to vegan power bread. With all this wonderful togetherness don’t forget to take care of yourself. Check out Sunset Valley vendor Aroma Secrets for homemade lotions with essential oils designed to combat winter fatigue and sickness. Try the Breathe Easy crème with CBD oil and peppermint to get over any lingering coughs. Head over to Medicine Woman Herbs afterwards to talk long-term solutions for smoking cessation help, cholesterol balance, or even pregnancy and breast feeding support. However you choose to celebrate this holiday season and beyond, make sure buying local is one of your priorities.